Give Great Life a try! Step 1-We bake our kibble at a temperature range of 175 to 205 degrees allowing for the destruction of pathogens while not destroying every nutrient. Step 2-After cooking – the kibble is now placed on a conveyor system- through extensive testing, we determined the correct temperature when the pores of the kibble expanded to maximum. Step 3- At this time, our custom freeze dried nutrient mix featuring Organic and Natural proteins, fruits, vegetables, enzymes, pre and probiotics, berries and more is saturated completely in every pore and around the entire kibble. 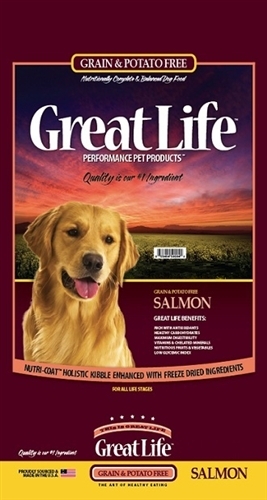 This allows for a greater concentration of active nutrients, thus allowing an animals’ system to receive all the nutritional benefits of a raw freeze dried diet. By keeping the moisture content on our freeze dried below 3%, we are free of any bacterial problems and allows the product to be shelf stable. Step 4- The kibble is cooled and placed in our bags and sealed. This is the reason Great Life is considered a power packed Super Food! Available in grain and grain free formulas, and canned. Save 10% on any size dry or canned food! New! Natural food dishes We have some big savings on one of our most popular foods!